Spectre was just a little less great than its predecessor, Skyfall. We got to see the Daniel Craig back one more times as James Bond and other old favorites reprise their roles as well: Ralph Fiennes as the new M, Ben Whishaw as Q, and Naomie Harris as the lovely Eve Moneypenny. Other new actors, both hero and villain, alike were also introduced such as Christoph Waltz, Lea Seydoux, Dave Bautista, and many more. In Spectre, we follow James take on a mission left behind for him from the Previous M. He plans to do it solo, in part because while this is happening MI6 is in danger of being replaced by a new type of technology that wouldn't require any more 00 field agents. It's James' job to finish what M left behind, but little does he know it is all connected to this new technology. The new M also realizes 007 may turn out to be the last chance for MI6. Although Bond starts the mission on his own, he soon turns to Q, and Moneypenny for help. And like other James Bond movies, in Spectre we get to see him seduce multiple women. The person he is trying to stop this time is an old friend, someone who has been affecting him in all the previous Daniel Craig James Bond installments — the puppeteer of all those bad guys he has taken down. I would say this villain is his biggest challenge yet. 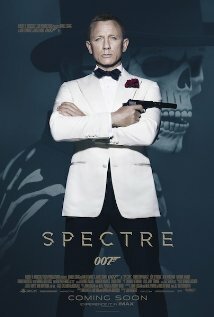 I enjoyed Specture but I liked Skyfall just a little more. Even though it's a long movie it doesn't slow down one bit. The cast was great and so is Daniel Craig.